Tired of loving Family Guy just for the hilarious jokes and absurd cutaways? We’ve got you covered! Celebrate the show’s 20th anniversary with this outrageous collection of 20 song-and-dance-filled episodes. 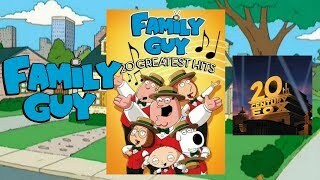 Go ahead, roast a “Candy Quahog Marshmallow!” and enjoy “The FCC Song” with your favorite “Shipoopi,” because “You’ve Got a Lot to See” (and hear) when you watch Family Guy’s 20 Greatest Hits!